I want to share with you this profound 1:31 minutes video. 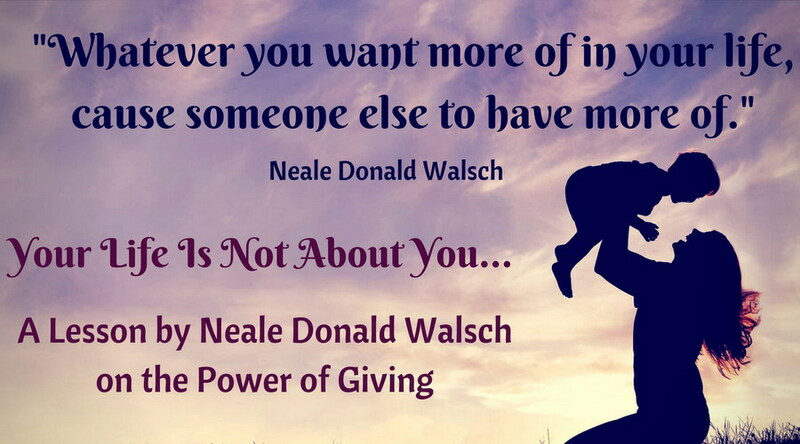 In this short video, Neale Donald Walsch explains the idea of why your life is not about you and shares an important message on the Power of Giving. Neale suggests that the key to lasting happiness and success lies in the act of enriching the lives of others. And this simple formula will change the way you look at your life forever. Enjoy the video! “What about moments when we are feeling down or depressed? What can we do to get in that state of understanding that life is about others? Find someone else who’s down and depressed, and give them what you want for yourself. If you want to get out of being down and depressed, take someone else out of their depression. If you want to have more abundance, provide more abundance for someone else. Whatever you want in your life, cause someone else to have in theirs. Be the source to the magic formula to get out of any bad space is to help someone else who’s in the same kind of space get out of it. What God said to me was, Neale, this is really very simple. The formula is ridiculously simple. Whatever you want to experience in your life, the end of a bad mood or whatever it is you want to experience, cause someone else who is having the same experience you’re having and trying to figure out how to end it. Be the cause of their ending their bad experience.